Information about Adventurous Activities is dealt with by Lawrence Mitchell, who can be contacted using lbmitchell@blueyonder.co.uk. Mountain Biking — summer and winter. Mine Exploration — with no vertical pitches, with ladders and by single rope technique. Snowboarding — on and off piste. 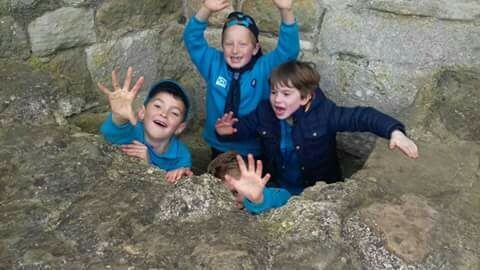 There are several air activities that may be undertaken by Scouts but they are not classed as adventurous. Leaders may seek an adventurous activities permit to take Scouts on any of these activities and the more adventurous, the greater the skills and experience that are expected. Some activities in protected surroundings may be undertaken by groups with only the permission of the District Commissioner. These include land-based activities in ‘Terrain Zero’ and water activities in ‘Class C’ waters. Terrain Zero (T0) includes areas up to 500 metres in altitude and within half an hour from a residence or tarmac road and must not include any steep ground. This includes much of the northern Pentlands. Class C waters in the South East Scotland Region are Craiglockhart Pond and Inverleith Pond in Edinburgh, the Musselburgh Lagoons in East Lothian and the Union Canal (from April to September). There is a register of assessors in the Region and they are responsible for assessing whether a leader has the technical skills and experience necessary to be authorised to take youngsters into more adventurous areas. The District Commissioner, acting on advice of the assessor, is the one who actually gives the authorisation and hands out the permit. We have a register of leaders with permits and some of them are very happy to take Scouts from groups and units other than their own. A range of water activities are available at the Longcraig Scout Centre. If you are in any doubt or wish more information, please use lbmitchell@blueyonder.co.uk. There are a number of opportunities for leaders to try something different.